Expansion Bellows can fail at the most inconvenient time. 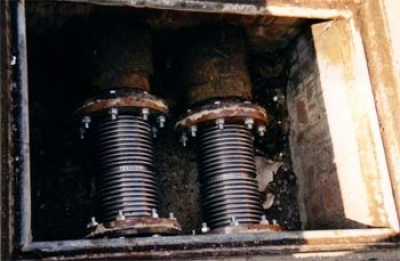 This was the case on a pair of (5") 125mm Axial units at Pembroke College Cambridge in January 2002.They were installed some years ago in underground ducts, with access covers in the footpaths through one of the main courtyards. Supplying practically all the LPHW distribution to the College as well as HWS calorifiers, most of which did not have electrically heated back up, which in turn meant a big problem with failure in the middle of winter. Supaflex was called in to make an inspection. They were found to be units imported from Europe no longer made in that pattern. They had been installed incorrectly originally with both facing the same direction i.e. the internal sleeve was opposing the direction of the flow and picking up all the system debris in the convolutions. Although the bellows were probably part of a constant temperature circuit resulting in a low number of cycles of movement they had survived quite well. Having been in the bellows business for almost thirty years, longer than most, Supaflex found this simple to solve. "Much of my time has been spent looking at schemes on how to use, how not to use and how to eliminate the need for bellows." The age of the system meant measuring the flanges, which were found to be BS10 Table "F". Two bellows elements were used with telescopic internal sleeves to fabricate replacements fitted with BS10 Table "F" plate flanges. These units are also of greater total movement than the original and result in a lower percentage movement per convolution. They will probably outlast the life of the system. From receipt of a telephone call on the Monday morning and an inspection the same day, the new units were on site and installed by Thursday lunchtime. two further 125mm units have since been replaced in the summer of 2002. Although these had not failed it was considered best to replace them. P & H Thermal Control Ltd installed both sets of replacements and the fast response to identify and replace the first two bellows, allowed the college to resume normal business quickly.